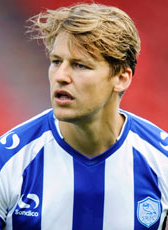 Glenn Loovens moved from Feyenoord to Cardiff City in summer 2006. Loovens was on loan at Ninian Park the 2005-06 season, but Cardiff have concluded a permanent deal with the Graafschap for the impressive centre back. In August 2008 Loovens moved to the Scottish league signing a 4-year contract until 2012. The Dutch defender has played a good period at Cardiff City and was one of the keyplayers at the Welsh club. During the last 1,5 year of his Scottish contract, he had not secured a place in the starting eleven anymore and his expiring contract was not extended. In July 2012 he made a move to Spain to sign a 2-year contract at Real Zaragoza on a free transfer until June 2014. Loovens played 21 matches in the 2012-13 season. He was released on a free transfer in August 2013. In November 2013 he joined Sheffield Wednesday in the English competition until the end of the year. After some good gameplay he extended his contract until the end of the 2013-14 season. Team captain Loovens has proved a dominant figure at the heart of the defence, making 77 appearances since signing on a free transfer in November 2013. The Dutch defender committed his future to the Owls with his original deal due to expire in summer 2016. He was contracted to Wednesday until the summer of 2018. In July 2018 he moved to AFC Sunderland on a free transfer. Loovens signed a 2-year contract.